Attach stirrups (handles) to two low cable pulleys. Grasp one stirrup in each hand and stand midway between the two pulleys. Step forward until the cables are pulled taut and your arms are left a little behind you. Keeping your elbows very slightly flexed, exhale as you raise the stirrups forward and upward in a semicircular motion until your arms are a little above horizontal. Inhale as you lower the stirrups to the starting position in a controlled manner. Keep your back neutral and your body still. Only your arms should move. When lifting heavy, stagger your feet and lean forward a little to improve balance. 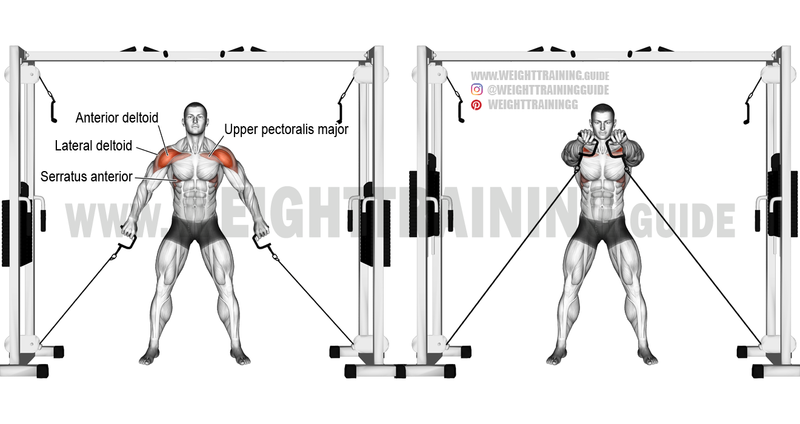 If you feel pain in your shoulder when you perform the double cable front raise, try decreasing the height to which you raise the stirrups. The point of keeping your elbows very slightly flexed is to preserve the health of your elbow joints. Instead of raising both arms simultaneously, you can alternate your arms. Use both variations of the exercise to derive the benefits of both. Please add leaning lateral raise.